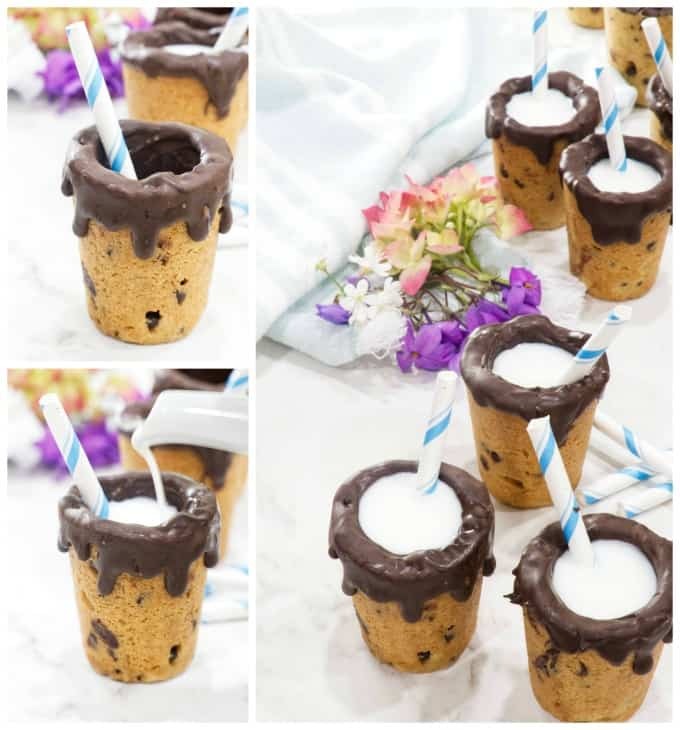 These chocolate chip cookie shots are the ultimate way to eat your cookies and drink your milk. 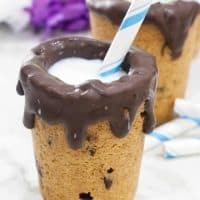 Chocolate chip cookie dough bakes into an edible shot glass that you can fill with a cool splash of milk. Milk and cookies never tasted so good! My husband and I recently took a short trip to New York. One of the stops that any food lover has to make is the Dominique Ansel Bakery. The French pastry chef has somewhat of a cult following for his trademarked croissant-donut hybrid, the Cronut. The flaky layers of delicate pastry taste like a cross between a croissant and a cream-filled donut. I planned to get my full limit of two Cronuts all to myself. Then I saw the pastry case. I wanted it all. This bakery has a lot more than Cronuts coming out of the kitchen. Since the bakery has a limited supply of Cronuts each day, they sell out pretty quickly. I was aware of the high demand so I drug my husband out of bed at 5:30 AM so we could arrive an hour before the bakery opened. Honestly, this is the first time I have ever stood in line for an hour just so I could have a pastry. I know, it’s crazy but it was worth it. That being said, if you happen to show up at this bakery and the coveted Cronuts are sold out, don’t fret. There a ton of delicious choices from sweet to savory. Go with someone that likes to share their food so you can have a nibble of a few things. I wanted to try it all, which made it so hard to choose only two things. Who else has this problem? Well, one of the awesome things that the bakery had was their chocolate chip cookie shot glasses! What?! These are genius! Apparently, these cookie shot glasses have been around for a while but I somehow missed the notice. Trying to re-create the Cronut is a three-day long process. You can get the Cronut recipe in the cookbook, Dominique Ansel: The Secret Recipes. On the other hand, recreating the little chocolate chip cookie shots is easy and hassle-free if you have a pre-made mold. So let’s make some cookie shots! What do you need to make chocolate chip cookie shots? Here is the breakdown of the things you will need to make these little chocolate chip cookie shot glasses. How do you make chocolate chip cookie shots? The cookie shot mold makes it easy to make these edible shot glasses. We found that a regular soft and chewy chocolate chip cookie recipe did not work as well and actually created a mess. A standard recipe for chocolate chip cookies will expand so far out of the mold while baking, it will fall onto the bottom shelf of your oven. Using the recipe we developed and chilling the dough will give you the best results. This is a stiff batter. It is thicker than most chocolate chip cookie doughs because it has a little more flour than usual. The recipe also uses much less baking soda than traditional chocolate chip cookies. Increasing the flour in the recipe helps make the cookie dough shot glasses firmer and more durable. These are perfectly crispy chocolate chip cookie shots. Just the way you want them. NO soft cookie shots falling apart before you can pour the milk in them. The recipe also uses less baking soda to prevent too much rise in the dough. A small amount of leavening helps lighten the texture of the cookie. However too much will make the cookie dough overflow and spill over the sides of the cookie shot mold. Since the cookie dough will naturally expand out of the shot glass molds while it bakes, you will get some overflow even without leavening. Another helpful tip is to refrigerate the cookie dough for an hour or two. Seriously, this step makes a tremendous difference. This cookie dough recipe has been developed specifically for cookie shot glasses. A standard chocolate chip cookie recipe will make a mess all over your oven. Even though this recipe was developed for the cookie shot glasses, you can use it for regular drop cookies. Keep in mind that the thicker batter does not spread out like a normal chocolate chip cookie batter. If you use this dough for drop cookies you will want to press the dough down after you drop it onto the baking sheet. The final thing to consider when you make the cookie dough is to use miniature chocolate chips. The standard chocolate chips are too big for these little shot glass molds. Another option is to chop some chocolate very finely but make sure the chocolate is small enough for the molds. 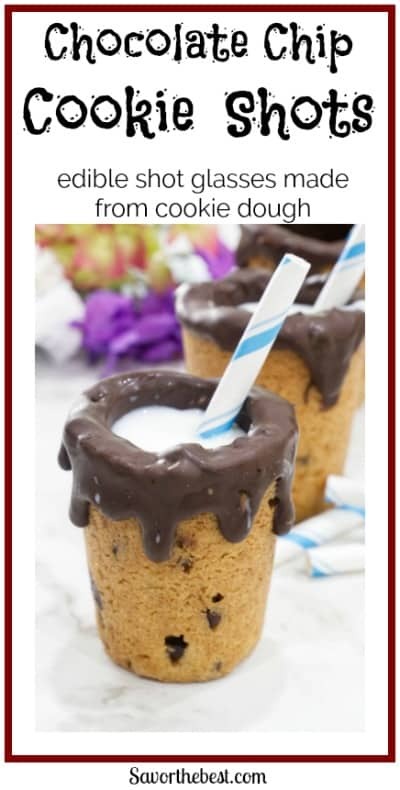 I used the Wilton Cookie Shot Glass mold for this recipe. It makes six cookie shots at one time and it is super easy to use. The mold is non-stick and the baked cookies slide out like a champ. I didn’t even spray the mold with non-stick cooking spray. However, it wouldn’t be a bad idea to give it a good spray just for a little extra insurance. First, you want to take the inserts out of the mold and set them aside. Next, take a ball of chilled cookie dough and pack it into the molds. Fill the molds about 3/4 full and give the dough a good packing. If the dough is loose it will leave holes and cracks in your finished cookie shots. Once the dough is packed into the molds, push the inserts down into the center of the dough. Displaced cookie dough will push out of the sides of the mold. Wipe away the extra dough and save it for the next batch. Finally, set the cookie shot mold onto a baking sheet and stick it in a pre-heated oven. The baking sheet makes it easier to handle the cookie shot mold. It will also catch any mess if your dough happens to spill over the sides of the mold. Just remember, messy spillage shouldn’t happen if you remember to chill the dough. How do you un-mold the chocolate chip cookie shots? The cookie dough will naturally expand while it bakes so you will get some overflow coming out of the molds. It will be a manageable amount and you can cut it away. The easiest way to cut the cookie shots level is to do it while the cookie dough is still warm. Let the cookie mold sit on a baking rack for a few minutes. 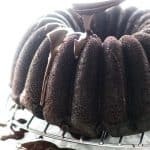 You only need to cool it enough so you can touch the mold without burning yourself. Once you can safely handle the mold, take a knife and cut away the extra cookie dough that rose out of the molds. Make sure you keep the inserts in the mold while you do this part. Next, you want to set the cookie shot mold aside to finish cooling. Don’t try to take the cookie shots out of the mold until they have cooled completely. Now, this step is pretty important. If you take the cookie shots out of the mold while they are still warm then they will be too soft and fall apart. Once the cookie shots are completely cool, remove the inserts by twisting them while you lift them out. After the inserts are out, remove the cookie shots the same way that you removed the inserts. Giving them a twist will loosen them from the mold and they will slide right out. The cookie shots need to have a water-proof (or milk-proof) barrier in order to keep it from getting soggy. A thick coat of chocolate not only provides a great barrier but makes these chocolate chip cookie shots even more chocolatey. I mean, really, chocolate coated chocolate chip cookies! How can you go wrong? There are a few ways to melt chocolate. No matter what way you do it, you need to melt it slowly. If chocolate is melted too fast it will overheat and get clumpy. First, you need to chop your chocolate up pretty finely so it heats more evenly. Then select your preferred way of melting the chocolate. If you use the microwave, use a low or defrost setting and stir it about every 20 seconds. You can let the bowl of chocolate sit in the microwave for 30 or 40 seconds after each blast of heat. Letting the bowl sit for a bit will let the residual heat in the microwave continue slowly melting the chocolate. Since chocolate is so sensitive to high temperatures, it is easy to overheat it in the microwave. Make sure you melt it in short intervals. The first minute or two of the heating process will seem like nothing is happening. Just be patient! If you melt the chocolate in a double boiler, make sure the water does not get in the chocolate. Even a very small droplet of water from the steam can cause the chocolate to seize up into a grainy, clumpy mess. Bring a pot of water to a very gentle simmer. Not a boil but a simmer! You only want to see a few small bubbles forming in the water. Then place a bowl with chocolate over the simmering water. For best results, take the pot off the heat and let the chocolate sit and slowly melt. The bowl does not need to touch the water. The hot steam under the bowl will slowly and gently melt the chocolate. You don’t even need to stir the chocolate. Just go about your business making cookie shot glasses. Within three or four minutes, it will be completely melted. Once your chocolate is melted, the fun begins. Pour about a tablespoon of melted chocolate into the cookie shot glasses. Now get a clean paintbrush and coat all around the inside of the cookie shots. Make sure you do not have any air pockets. Even a small bubble will leave an uncovered spot for milk to soak through. A second coating will ensure there are not any uncovered areas. After the cookie shot glasses are coated, give the tops of the cookie shots a dip in the melted chocolate. A coat around the top edges of the cookie shots will give them a nice finished look. After the chocolate is dried and set, you can pour some cold milk and enjoy your cookie shots. If you’re not going to serve them for awhile them wait until it is time to serve before pouring the milk in them. Check out our video to see how easy it is to make these chocolate chip cookie shots. Have you made these chocolate chip cookie shots? TAG US! 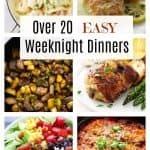 If you made this or any of our other recipes we would love to see it. Snap a picture and tag us on Instagram and Facebook. Hashtag it #savorthebest. Turn chocolate chip cookie dough into an edible shot glass. This is the best way to eat chocolate chip cookies. This recipe uses this cookie shot glass mold. Toss the butter and both kinds of sugar into a mixing bowl. 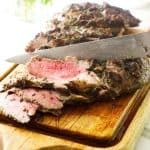 Beat for a couple of minutes until it is light and creamy. In a separate bowl, combine the flour, salt, and baking soda then gradually add the flour mixture to the butter mixture. The dough will be thick and stiff. Stir in the mini chocolate chips. For best results, refrigerate the dough for one or two hours. Pre-heat the oven to 350°F while the cookie dough chills. Pack balls of chilled cookie dough into the cookie shot mold. Press the inserts into the center of each mold. Some cookie dough will push up and out of the mold. Leave the inserts in place and scrape the excess cookie dough away. Bake for 20 to 22 minutes. Halfway through the baking time, use an oven mitt and push the inserts down again. Cookie dough will expand out of the mold as it bakes but you can remove the excess later. When the baking time is finished, let the cookie shots cool for a few minutes so you can handle the mold without getting burned. While the cookie shots are still warm and with the inserts still in place, scrape away the excess cookie dough that expanded out of the mold while baking. Once the cookie dough is cool, twist the inserts and lift them out of the mold. Next, twist the cookie cups and lift them out of the mold. Set the cookie cups aside while you prepare the chocolate coating. To melt the chocolate in the microwave place it in a microwave proof bowl and melt it in 20 to 30-second intervals, stirring in between. To melt the chocolate in a water bath, simmer some water then turn off the heat. Put a bowl of the chopped chocolate over the hot water and just let the chocolate sit for several minutes. Whatever method you use, don’t rush the melting process or it will get thick and clumpy. Chocolate that melts slowly will be smooth and easy to work with. Pour a little melted chocolate inside the cookie shot glasses then use a clean paintbrush to thoroughly coat the inside cavity of the cookies. Turn the cookie shots upside down and dip the tops of them into the chocolate then set them aside until the chocolate is completely set. After you coat all the cookie shot glasses, go back and inspect them for any areas that did not get coated well. Give them a second coating if needed. Once the cookie shot glasses are finished, fill them with a splash of cold milk. Make sure to use mini chocolate chips in this recipe. Large chocolate chips are too large for the mold. Another option is to use finely chopped chocolate. We used dark chocolate to coat the inside of the cookie shots but candy melts will also work. If your not particular then the candy melts are easier and a bit cheaper than chocolate. Placing the cookie dough in the refrigerator will help prevent excessive amounts of cookie dough from spilling over the sides of the mold while baking. Yes, Ashley. Thank you so much for that question. I added it to the recipe card and it is updated. These look like so much fun! I can see filling them with other things too! This is the really amazing post. It’s a very great idea. This chocolate chip cookie cups look so beautiful. I like this. It is better for my child. Thank you very much for share your chocolate chip cookie article. 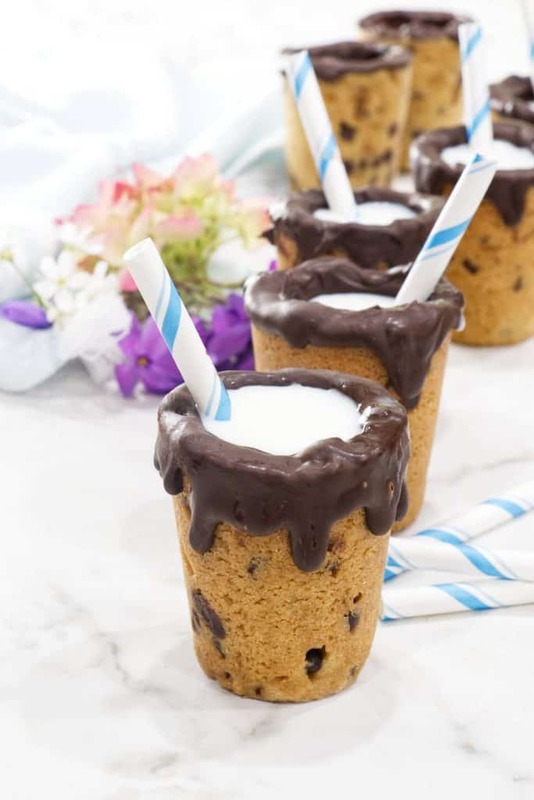 These chocolate chip cookie cups look so delicious! 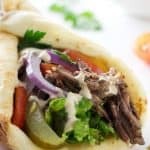 I love how creative this recipe is! Perfect to make with kids too! Thanks Natalie, these really are fun to make with the kids. They get excited about it and always finish the project!!! wow! 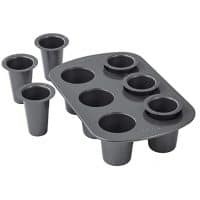 I have to tell you I did not know about cookie shots and cookie shot moulds until today! I just froze at the video where you are pouring milk into them! 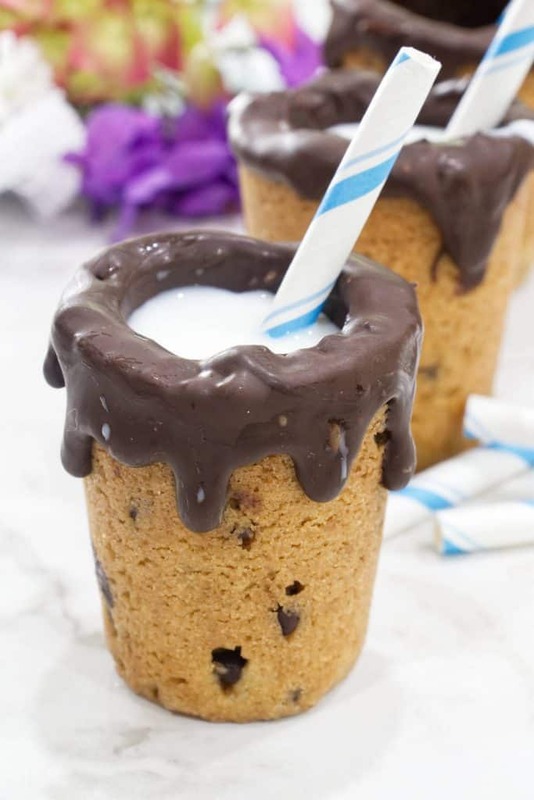 This surely is the best way f eating chocolate chip cookie or even drinking milk! Such a cool idea. The kids are going to love these. How cute are these! I bet these would go down well at a kids birthday party. Danielle, so true! They are great for kids birthday parties. These look pretty over the top decadent and amazing! What kid, or adult wouldn’t love one of these? What a cute and creative idea! I love the look of them. Plus, chocolate chip cookies and milk are a perfect pairing. Thanks for sharing.